Ancient cosmology observed and identified a dynamically balanced relationship between five elements that occur in nature. They are: Wood, Fire, Earth, Metal and Water. 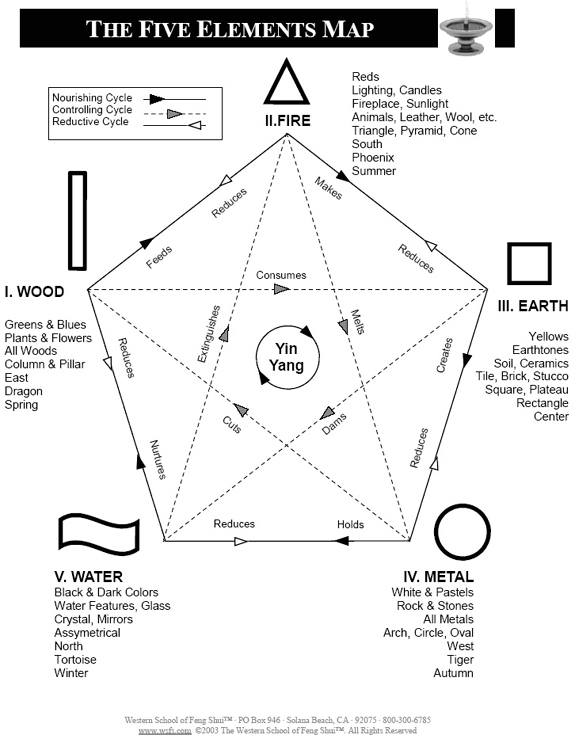 The map below demonstrates how each element relates to the others. According to quantum physics, everything in our environment emits an energetic vibration. All material things are made up of tiny molecules and atoms that are constantly in motion. Every object in your home is abuzz with its own unique energy frequency that influences how you feel on a daily basis. In Feng Shui it is said that everything in our environment is talking to us all the time. Using the five element system, we can tap into the invisible energies of inanimate objects to balance and harmonize our environment. My goal as a Feng Shui practitioner is to make your environment sing!